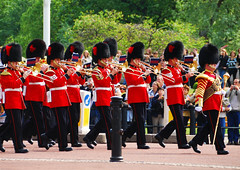 What vist to London is complete without watching the Changing of the Guard. The red coats, furry hats, trumpets, rifles, swords. Fun for young and old… mainly old judging by the crowd. Parading up The Mall today were the Queens Life Guards, the Army Air Corps and the Coldstream Guards Band.